American Guinea Hogs are an old heritage lard breed native to southeastern America. They’re known for their friendly and laid-back temperaments, moderate size, hardiness, foraging abilities, mothering instincts, and mouth-watering meat and lard that is highly sought after by chefs. We chose this breed over a decade ago because we needed an animal that would be friendly and docile enough for our kids to handle, but also thrifty enough that they could take care of themselves for the most part and live off the land. Our hogs have mostly Setty/Celesky and Biggers blood. 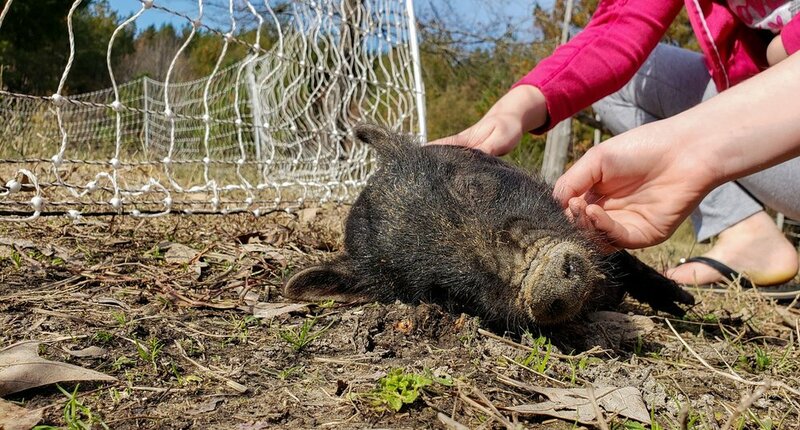 After over ten years of observing our hogs we have reached a sweet spot with this mix—getting vigorous hogs, longer and sturdier builds, laid back temperaments, mothering instincts like no others, and hardy hogs that can forage for the majority of their food. We breed for friendly temperaments, hardiness, sturdy conformation, mothering instincts, and adaptability. Hogs that don’t meet these standards don’t get to pass on their genes. One of the most important things we breed for is mothering ability. Sows are expected to be able to give birth without any assistance, not loose any piglets (first time mothers are forgiven for accidents, but we try to breed for no less than a 95% survival to weaning percentage), provide more than enough milk, be able to keep weight on while nursing, co-nurse and adopt piglets when needed, and raise robust fast-growing piglets. We let our sows farrow naturally; on pasture and woods, with optional shelter for them to give birth in. We let piglets stay with their dams until 10 to 12 weeks of age. By that age they are fully capable of living without milk. Throughout this process we are evaluating the piglets for registration. We are members of the AGHA (American Guinea Hog Association) and pride ourselves on only registering the most exceptional examples of the breed, which is usually no more than two or three hogs a year. If you are looking for registered hogs or piglets, please contact us to see what we have available or to get on our waiting list. At the very least we can recommend you to another breeder if we don’t have anything available. We usually have feeders (barrows only) of varying ages for sale.